Hockey, football and soccer equipment can have very unpleasant odors. The perspiration odour of your equipment is so strong that it impregnates the car when travelling to the arena? SPORTS ODOUR can eliminate these persistent odours in minutes. How to Neutralize Perspiration Odours in Sports Bags or Sports Equipment? Spray SPORTS ODOUR inside sports bags and onto other equipment (skates, gloves, etc.) after each training session. Whether damp or dry, SPORTS ODOUR will be 100% effective. Allow the product to dry naturally. If this is the first time the product has been used, the perspiration odour may persist. A second treatment of SPORTS ODOUR in the same week will ensure the product penetrates into all the equipment fibres. One application will be sufficient each subsequent time. 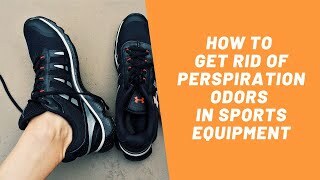 SPORTS ODOUR can also be used in shoes and boots. SPORTS ODOUR leaves a fresh scent.